- The word DOING is created out of hand-crafted ice blocks, carefully arranged into monolithic letterforms on a pristine glacier. - The word THINGS is made by suspending over 2,000 clear Absolut bottles in a serene forest, readable only when directly beneath them. - The word DIFFERENTLY is presented in a field of wheat, with teams painstakingly forming the crops into sculpture. - The words LEADS TO are formed by crews holding paper lanterns to the ground in a remote canyon, then releasing them into the night. - The word SOMETHING gets revealed as groups of people coordinated throughout city rooftops raise huge helium-filled letter balloons. - The word EXCEPTIONAL is crafted in a stunning artistic representation of vodka distillation, with the liquid traveling through a mesmerizing glass journey. The Absolut Anthem film is beautifully put together, but I think the way that the activity has been 'socialised' is interesting. 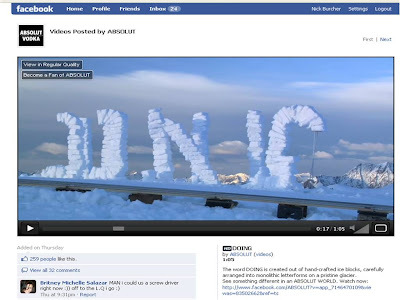 Linking to Facebook from YouTube, embedding YouTube video into Facebook page, overlaying with 'Become a Fan Of' option and promotion via the stream and bespoke ad, are all interesting ways of using Facebook as a central platform to a wider campaign. 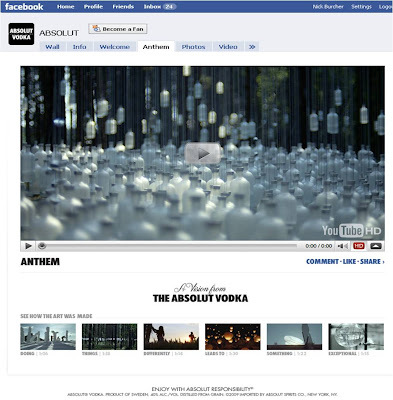 The Absolut Facebook presence is allowing Absolut to create deeper engagement around 'broadcast' advertising by allowing consumers to comment, share etc. The Absolut Anthem video has 25,000 views through YouTube and is 'liked' by 648 people on Facebook with 71 Facebook comments (with the additional videos also having additional 'likes' and comments.) 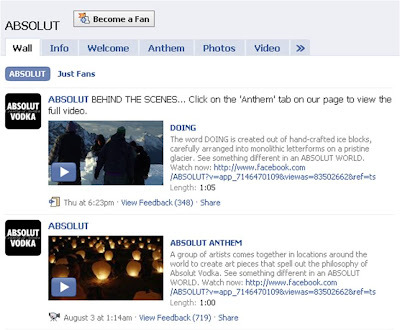 Absolut now have 440,940 fans on Facebook which gives a good base for continued 'socialisation' of future marketing too.